The Christmas season is over and it’s back to real life. And that real life has involved a lot of germs and coughing around here. So I made sure to take some time away from nursemaid duties and re-charge my batteries a bit. I made a trip over to Wamego, KS for Winter Woolfest 2019! First I’ll flash all the goodies I found with my Christmas cash. 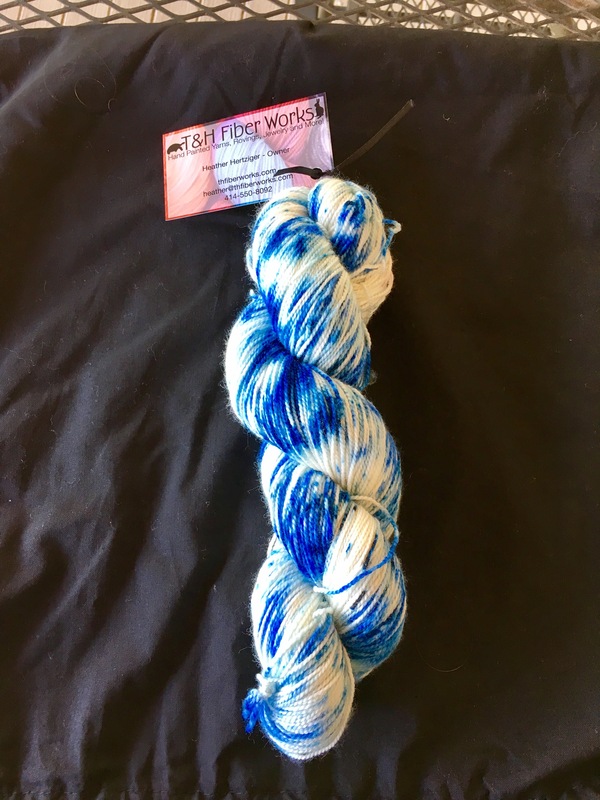 I focused my monies on independent dyers and especially those I haven’t seen before. I grabbed a Little Lamb children’s book with pattern from Melissa Dallke. And four 20 gram mini skeins from her Acorn Willow yarn line for my scrappy blankets. Then I snagged a speckled DK yarn from Leon Alexander in glorious shades of purple. Next up is a dark grey and rainbow-y skein of sock yarn from the Wichita Woolery. It’s called Prism Break and it should micro stripe if I get the gauge right. Finally I finished up at a LYS booth that had several indie dyers. I gravitated to the speckles again. I picked up some Super Sock 4ply from Twisted Owl Fiber Studio in the Razz-ma-tazz color. I listen to their podcast, the Worsted Knitting Podcast when the occasionally drop episode and it’s hilarious. And lastly I picked up some Pebble Sock from Black Trillium Fibers in the Happy Fun Times color. I didn’t go overboard and I was very pleased with my purchases. It was a beautiful sunny and weirdly warm January day here in Kansas. The attendees were slightly sweltering in their knitwear this year! This year’s theme was Classic Rock N Roll. It wasn’t quite as cool as last year’s female super hero theme but still adorable. And this festival has really grown. This place was PACKED by 11 am after the doors opened at 10 am. It was honestly hard to move around and get into most of the booths. This kinda triggers some anxiety in me and was my least favorite part. P.S. This Wamego is kind of Wizard of Oz themed because they have the Wizard of Oz museum. And the whole town has kind of rolled with it. They have a tulip themed Toto that made me smile! I told you about my experience at KITHKC yesterday….now for the goodies! My plan this year was to try out vendors or products that aren’t already in my stash or that I haven’t used before. I may have huffed a few too many yarn fumes. I was a little carried away but not too terrible I hope! 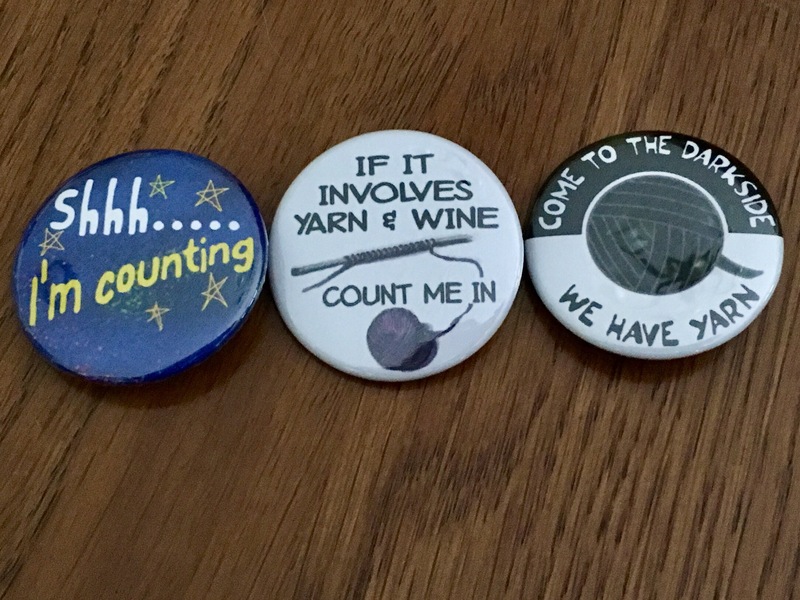 My first purchase was from Willow Island Designs. I picked up the Xs and Ox sock sack at the top left corner and the blue plastic sock blockers at the bottom. And then they threw in the Xs and Os notion pouch as a free gift. The craftmanship was excellent on these bags and I can’t wait to use them. Next up, I hit Show Me yarns where I found a wonderful rainbow sock blank (bottom left) and some minis (top center) for my memory blanket. The sock blank is the Gateway Sock Blank in Girl Power and its 75/25 merino and nylon. The minis I think are their Bootheel bases in some random colors I picked. Then I wandered into the Potion Yarns booth and fell in love with her speckles. I eventually settled on a skein of her Temptress DK weight in the Walk on the Left Side colorway (top right). I think this needs to grow up to be a squishy hat. After that booth I the McKnittey yarn shop booth. They weren’t an indie dyer but rather an LYS. They had quite the selection but I found some Three Irish Girls that just reached out grabbed me (top right). I must have been in a green/speckles kind of mood because I couldn’t bear the thought of leaving without that skein! It’s their Adorn Luxe 85/15 merino and nylon base in the Rollin In the Clover color. It’s amaze balls…. And finally I felt the need for one more project bag. I hit up the Supernatural Yarns booth and I knew I already had some of their yarn sitting in my sock stash. So I perused the bag selection. I found a nice two skein sized zippered project bag in a delightful woodsy theme. I have a lot of single skein project bags so I felt good about adding some different sized options. The tote bag and tape measure came with my class registration. I’m really thinking about asking my mom to embroider my name on the bag for me…. And in case anyone likes any of the goodies above…below are the cards I managed to snag while shopping in case the details interested anyone! I heard about the Mid-Plains Fiber Fair on the Prairie Girls Knit and Spin podcast awhile back. 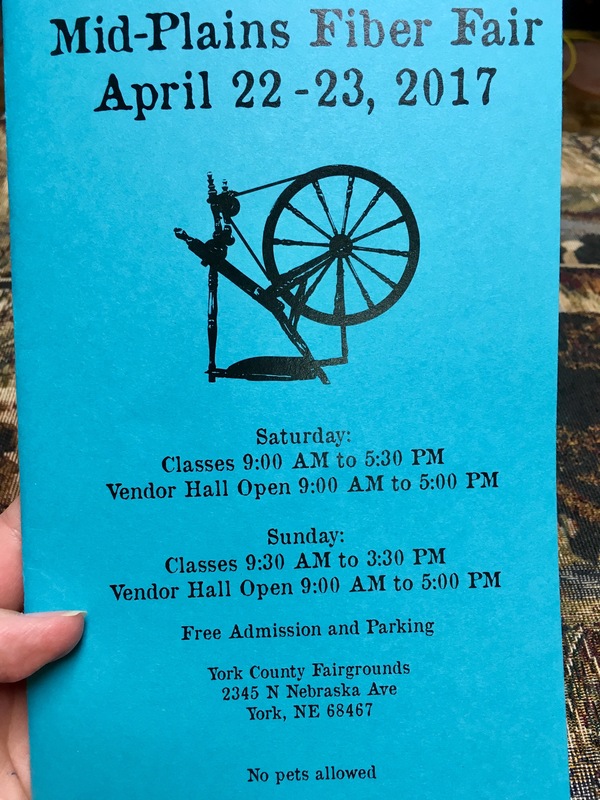 It was held in York Nebraska, which is a not so bad drive from my parents house. So I left Jellybean with Grandpa and I loaded up the car with my mom and aunt and headed out! It was a beautiful day and we arrived in short order! It was the first year and relatively small but well organized and very nicely laid out. There was a ton of raw fiber and a lot of alpaca yarn. Neither of those things are my sweet spot but I found a couple of gems to come home with. 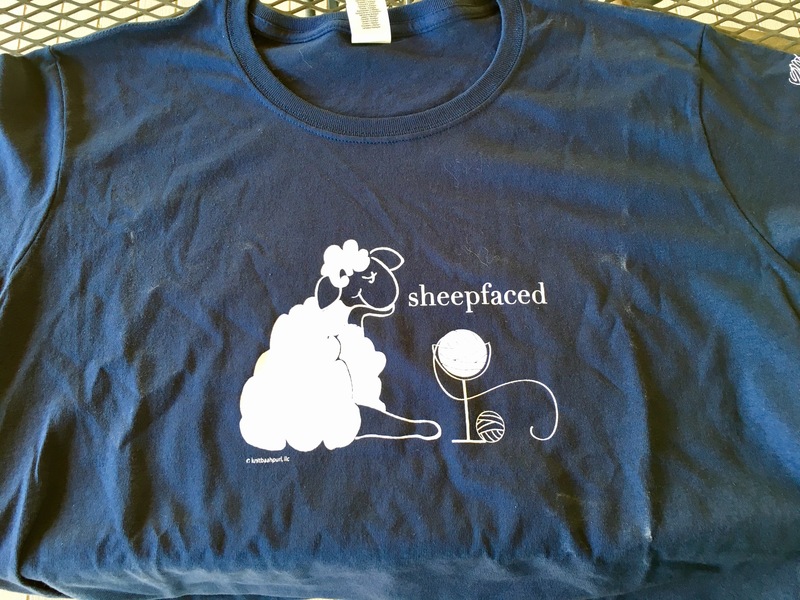 I got a shirt from KnitBaahPurl. It’s complexly adorable. Then I was on the hunt for yarn for an upcoming shawl. 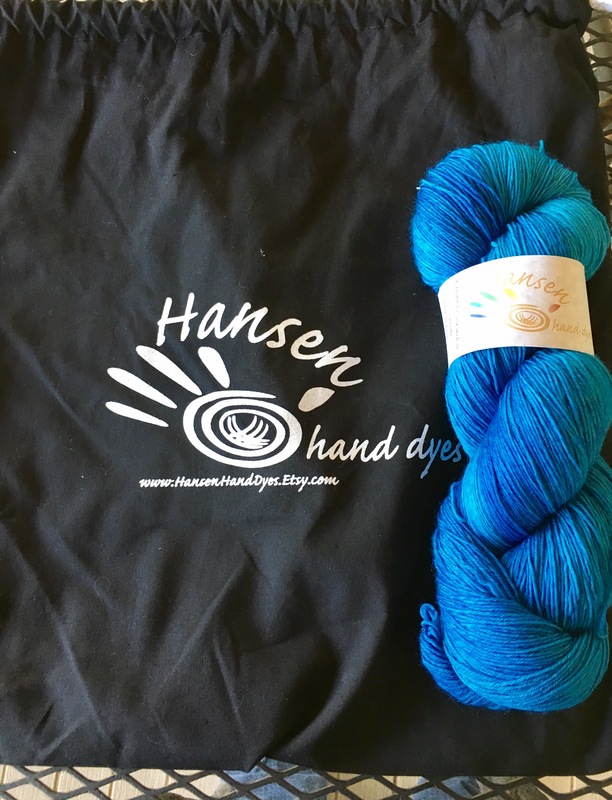 I found the main color at Hansen Hand Dyes. It’s their Mega Merino skein of 820 yards of SW Merino in Boys Don’t Cry. And the contrast color at T&H Fiber Works. It’s their Heather’s Favorite sock in Blue Suede Shoes. I also pointed out some items to my mother who might have done some Christmas shopping! The festival was fun ans I’ll definitely go back. 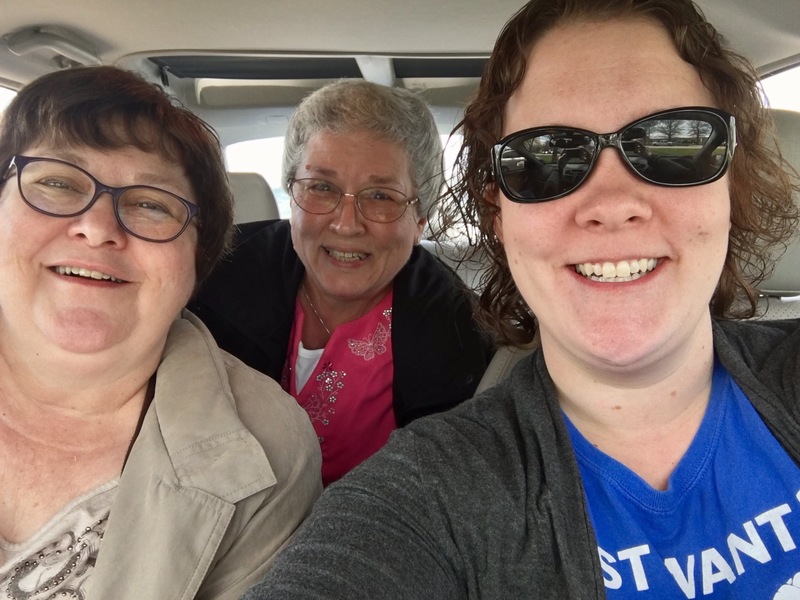 It was especially fun to spend the day with my mom and Aunt!